Net worth is “duh” levels of simple: take your assets, subtract your debts, voila. Except if you overthink it, and of course I overthink it. I have a Ph.D., it’s basically my job. A major point of contention I see — and don’t have to deal with — is with real estate. Nobody actually knows what their home is worth (until they try to sell it), so trying to calculate equity with precision is tough. Meanwhile, it’s pretty clear what the mortgage is! Many people include the presumed resale value of their cars. I did that when I first started using mint.com last year, and if I’d kept up with it, I’d have been in “positive” territory a couple of months earlier. But ultimately I decided that the car wasn’t really an asset in the sense that I was comfortable with. If tough times hit, I still wouldn’t sell it; I need it for basic life stuff. So just like I don’t include the value of my one nice piece of jewelry, or my computer, or a few other things that I theoretically could sell but never would, I don’t include the car. I might feel differently if it weren’t ancient and cheap. That is, if I owned a new-ish car, I might list it because I’d be able to trade down if I needed to. But really there’s nowhere to trade down to, given my 14-year-old car. If I had a house, though, it would always be theoretically sellable for me if I lost my job or etc, so I probably would count my best guess at it in my net worth. The other sticking point to me is: should I count cash that I know is about to disappear? I generally calculate on the last day of the month, that is, the day before I send in my rent check. My budget suggests that I’m probably going to spend about half my income in any given month. I feel like a more honest net worth might include only the content of my savings/retirement accounts and ignore the money dedicated to daily expenses. However, I am really lazy, and sorting this out would take a lot of work! So, the end result of my net worth calculation is this: I take the contents of all my checking/savings accounts (I have a slew of them) and add that to the total of my retirement account. Then I subtract my credit card debt (and used to subtract student loan debt. Hey, doesn’t that “used to” sound nice?). It might not be the most accurate number, but it feels pretty close to what’s right. Do you guys do something different? On a whim this morning (I have weird whims while I’m having my first-thing cup of coffee) I looked at my tax returns going back to 2007, which is the first time I filled out a pdf and thus have a copy saved on my computer. It was also the first full year I was in graduate school. It turns out that from 2007 through 2012 (the last full year I was a grad student), I made anywhere between $25,000 and $35,000 a year. While single and living in New York City. My first thought is that it’s a good thing I don’t have any really expensive bad habits, like drinking or gambling. My second is that it’s a freaking miracle I made it out with only $19,000 in student loans. I also had a guest this past weekend, and since we have mutual college friends that live here, not only did me and my friend go out to eat twice, but we also bought food so we could have our friends over for dinner. And even though all this pushed me over budget for the month, and I’m having some mental trouble with that, I think I need to relax. The two meals out were about as inexpensive as possible: we had pupusas on Friday night for less than $10 for both of us (I paid) and breakfast at a diner on Saturday morning for somewhere between $10 and $15 (she paid…and omg, as I write this, I’m realizing that I was still sleep-deprived enough that I forgot to leave a tip on the table, as I’d promised to do when she went up to pay the bill. Jeeeeeeeeeeeeeez. Sorry, waitresses.) So, even though if I’d been on my own I would have eaten both meals for ‘free’ at home, eh, I can’t get too worked up. I’m not really sure how I’m going to handle this in the future. Right now I’m handling cooking for others on a budget by doing it less, instead of by finding less expensive ways to do it; it just seems wrong to have people over and not feed them something interesting and made with high-quality fresh produce 🙂 Plus, when you’re cooking for more than one, quantity issues come into play. The title of my post started off as having decided that I did put a priority on not being overly “cheap” — as obsessed with money as I am lately, I don’t want to get so obsessed that I stop having people over, you know? But as I type, I’m feeling like I ought to spend more time thinking about how to really cut those expenses down. Like, could I make a pasta dish with vegetables and cheese instead of the four kinds of middle eastern salads I made on Saturday night! I don’t know. Deserves more thought, I guess. I just got the confirmation statement that my employer set up my new 403(b) account — there’s no actual money in it yet (and sadly no employer match) but at least it looks like things will be good to go for my next paycheck. Actually the whole thing is doing reasonably well. It’s still super tiny, but I’ve added another $500 to my Roth IRA this month (all side hustle income) and the whole thing has collectively grown about $170 since I started it. It’s good to watch that, although I’m not really looking forward to my first sustained market downturn, whenever that shows up. Anyway, all basically good, and July should be a respectable if not spectacular month on most fronts. I’m in one! There are a few external reasons why I’m a little more anxious than usual this week, but it’s definitely playing out in money worry (as usual lately.) Objectively, I know things are just fine. My retirement account is still tiny, but I’m making (relative to my income) nice big contributions every month, and have made it impossible to change that easily by having most of it deducted from my paycheck. And yet, here we are, being anxious. I can’t quite get my numbers to line up in YNAB vs my online bank account records, and even though the discrepancies are fairly small, they’re still worrisome. Where did I go wrong?!?!? Even though I think it’s a solid decision that will make my budgeting life easier going forward, the idea of not making a substantial debt payment in July makes me a little crazy. I want to see that slider going down, not staying stable or even going up a bit. Also making me crazy: the number of not-quite-planned-for expenses that have either appeared, or are looming. These include: buying plane tickets for a wedding (and whatever expenses I incur while traveling); the electricity-related food expenses for this month; some car stuff (registering it in a new state, and it’ll need an oil change soon and possibly some more work, some of which is optional but would really improve my life, and some of which might not be optional); an unplanned trip into Nearby Really Big City that included two meals out, gas, tolls, etc); and an impending visit from a friend this weekend, which I’m really excited about but which means probably one meal out and also buying groceries to have mutual friends over for a nice meal; medical co-pays for upcoming therapist and dentist visits. I’m hoping to start a “slush” savings fund sometime this fall (separate from my emergency fund), to handle stuff like this without so much anxiety, but obviously I’m not ahead of myself enough to have done that yet. Well, I don’t know if typing all that out made me feel better or not, but I think it does help to just share the “blah” with the universe sometimes, so…here you go, universe! You’re welcome! I still don’t know how much I’m going to make on a normal paycheck (I did get paid on time this week, but it was weird because none of the 403(b) or tax withholding paperwork had gone through yet) so I can’t work out a proper budget until the end of the month. But I was thinking today about the different ways people can use a budget. Right now I’d say I see a budget as a disciplinary tool. If I want to save X amount, then I only have Y amount to spend. I’ve set my various discretionary budgets (groceries, entertainment, that kind of thing) pretty low, low enough that I am constantly at a low level of stress about them. Sometimes that works out pretty well. Like, today I really wanted to stop on the way home from work and buy a scone or a brownie or something. But I knew that would be in the range of $3 and my food budget for the month is on the brink of not making it. So I came home instead and made brownies with stuff I already had. But a lot of mental energy went into that decision! I can envision another way of budgeting that would be a lot more relaxed. Right now I’ve set my food budget at $250 a month, and I also have $50 “pocket money” a month, and I suspect about half of that will end up going to food too. Probably, if I set my food budget at $400, I would occasionally have to stop and think, and I certainly wouldn’t be booking reservations at Per Se. But I also would be able to pretty much pick up whatever I wanted in terms of groceries, and eat out a couple of times a month in a low-key way. If I set it at $500, I could have all those things and I’d probably have money left in the category to roll over and save up for big events like hosting Thanksgiving or something. In that case, budgeting is less a tool to keep the less than totally frugal in line, and more a way to roughly allocate income to different categories. If I magically start making more money next year, I’d like to switch to that way of budgeting; what I’m doing now is good for me in some ways (I probably didn’t need that scone anyway!) but also really is a kind of permanent stressor. How do you use your budget? Is it more about restraining you from reasonable things that you can’t afford, or more about giving guidelines? Many years ago, an old friend—an artist who deals with the alchemical—told me that after his father’s death he left the hospital, went home, sat down at his desk and, for the first time in his life, balanced his checkbook. I asked him how that went. Good, he said. I had more money than I thought. I might have mentioned in passing that what inspired my retirement account, my dedication to debt payoff, and this blog (all born at the same time in March) was a bit of a mental health crisis. No need to be alarmed — no hospitals were involved — but it definitely qualified as a major event. I was, and am, having a lot of trouble dealing with life instability, and I’m haunted by depression. It’s not the same position, but I recognized that instinct, that sense, in the midst of crisis and even trauma, that putting your finances in order is the thing to do. Money’s not the real problem, in either case, but the real problem is unsolvable; in the meantime, you can get your head around balancing the checkbook or making the budget. The article is Dave Byrne, “My Father’s Files”. It’s an Honor Just to be Nominated! 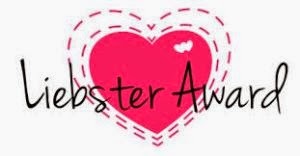 As she explains in her post, this is meant to highlight some smaller blogs, like the one belonging to yours truly, and provide a little networking goodness. There are two conditions of accepting this award — one of which is to nominate five more blogs, and one of which is to answer a few questions posed by my nominator. I am happy to do both! 1) Alicia at Financial Diffraction — Alicia’s blog might actually be on the “big” side for this award (I feel like I saw something somewhere about 200 twitter followers, and she’s got more than that) but I’m going for it anyway. Alicia is sensible, down to earth, and, like me, trying to figure out debt repayment and retirement savings after WAY too much graduate education. I love it when I see she’s updated. 2) The Budget and the Bees — this is a new blog for me; I found it following a link from someone else’s comments (I find a lot of blogs this way.) I like her style — both in terms of writing and in terms of her thinking about loans, life, and spending. 4) Indebted and in Debt — written from the perspective of a woman who would like to stay home with her kids, but can’t afford it. It’s a very different set of problems than I have, but it’s a really raw and emotional blog, and it’s easy to sympathize. 5) Cindy at Growing Her Worth — not updated all that often, but I wanted to mention it because we mid-30s single women living in the midwest have to stick together! The first few weeks I was reading PF blogs I did read a lot of “big” blogs and “how-to” posts, but I definitely have gravitated towards blogs that are more ongoing inner narratives, with regular people sharing their ups and downs and just brainstorming about options. 1. What is the best advice you’ve been given/read since starting your blog? –I got a lot of very thoughtful emergency fund advice. But I’d say the most useful overall advice was that I should not wait until I was out of debt before starting a retirement fund. 2. What is your favorite book? –Oh, I’m bad at questions like this. It might be Middlemarch. Which is actually a great book for PF bloggers to read, come to think of it. I should do a post on that. 3. What is the one food you can’t say no to? –Coffee! Does coffee count? Oh man, I start looking forward to my morning cup around 2 pm the previous afternoon. If beverages don’t count, then I’d have to go with bacon. 4. Who has been your biggest supporter through your debt repayment (or blogging) journey and why? 5. Do you keep your Cheese Whiz in the fridge or in the cupboard after you’ve opened it? Thanks again, Downstairs and in Debt! It was a perfectly sunny afternoon, not too hot, blue sky, clouds, and there were only a few other people out picking. I took my bucket and wandered towards the back corner of the orchard. I don’t think there were any entirely untouched trees, even back there, but there were more cherries for sure, so I started to pick. Because it was so late, most of the cherries weren’t at a height that was natural for me, so I spent a lot of time reaching up and down and twisting to duck between branches and get cherries that were a little less accessible. I’m not that romantic about farm work — it’s really hard, often brutally underpaid, and I have mad respect for anyone who does it all the time; I can’t imagine what it does to the body over the long term. But I have to say, it was an incredibly pleasurably hour. It was so quiet back there, just a few human voices, no traffic sounds, and it was so satisfying to be doing work that I knew would directly lead to some really fantastic pies over the course of the summer! I spend so much of my time, both work and personal, disconnected from the outside; my current office doesn’t even have a window. It felt great to just bathe in it, to be completely centered in the moment. Without planning to, I started to meditate, thinking about the concept of gleaning. Before the advent of modern industrial machinery, even the most professional harvesters always left something behind in the field. The task of gathering in the last scraps of edible food was usually left to women and children. I’m not as poor as the poor Leviticus speaks of, but I did think about all the women who had gone through fields before me, for thousands and thousands of years, bringing home the fruits of their labor, all the harvest that the first pass hadn’t bothered to collect. 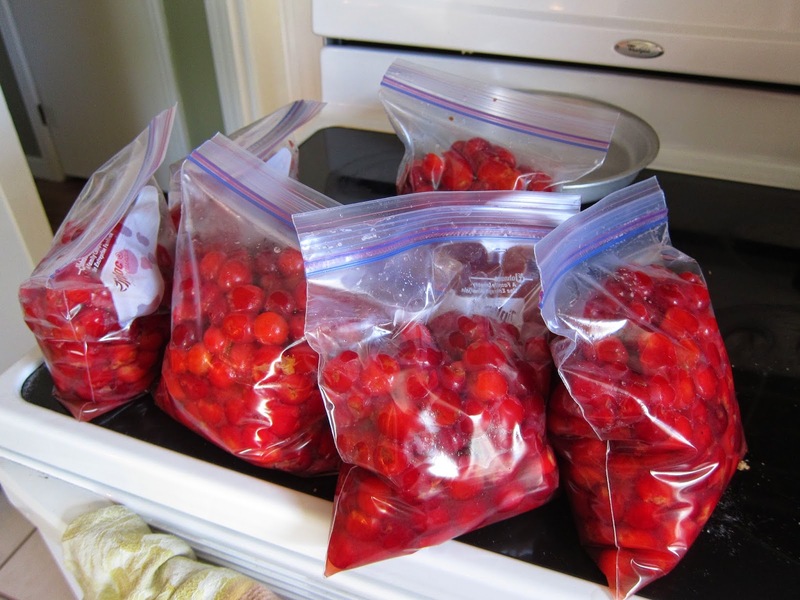 This is what 17 pounds of sour cherries look like, by the way, after they’ve been pitted and portioned out into quart bags for freezing. So, having my student loans paid off is still settling in, mentally; I find myself double-checking in mint, just to make sure, you know, that they’re really gone. And also to look a little despairingly at the credit card balance still remaining, which is going to take longer to ditch; if only I’d had just one more month at my old rate of pay…. Oh well. But that sort of brings me to what I want to talk about today: what worked for me and what didn’t. I got the loans paid off in a year, which was my initial goal, so that’s all well and good. But what I did not do was pay them steadily. I could have paid (roughly) $1600 a month for twelve months, around 41% of my take-home pay. Instead, I used several months of my grace period making payments of other kinds: purchasing a used car, paying off credit card expenses incurred in moving and in the wisdom teeth removal I had to have last spring, buying furniture. I didn’t start making student loan payments until the end of September, with my third monthly paycheck. This already had me in a place where I’d have had to pay just under $2000 a month for ten months. But I wasn’t steady at that either; I missed a month almost entirely in February to make a tax payment, and there were other months where after I’d paid off my credit card, which I wasn’t really budgeting, I had much less to put to debt than I’d have liked to. In the end, I was behind enough that for the last several months, in order to meet my goal, I had to pay $2500 a month! This meant a hit to other goals: paying cash for moving expenses, starting a savings account, etc. I didn’t do a lot of truly frivolous spending over the past 12 months. But in retrospect, if I’d been paying out consistently on those loans every single month, before starting to spend what was left, I would have been stricter about a number of things, ranging from furniture to entertainment to food (of course, always food). It’s a good thing for me to keep in mind as I embark on a lower-income year: put the money where your priorities are, first, and then figure out the discretionary spending from there.